June 29, 2012: The captioned meeting was convened in Washington, DC on June 14-15 by the Governments of the United States, India and Ethiopia. It was organized in close collaboration with UNICEF in order to bring together decision makers and thought-leaders to identify the smart investments to collectively end preventable child deaths. 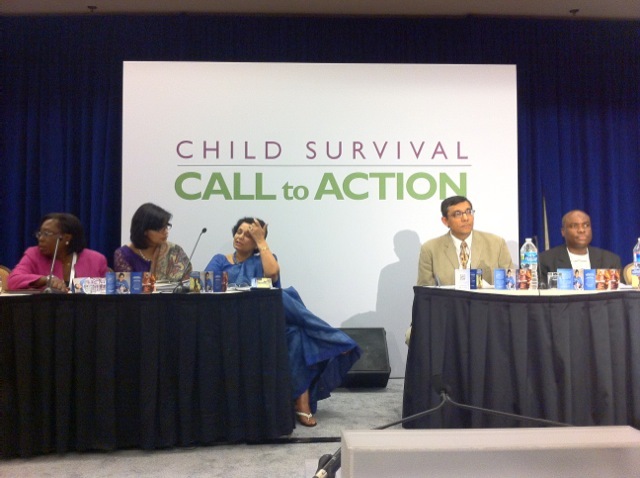 Our president, Dr. Sania Nishtar was a panelist in the session on “How to Reach Every Child with Essential Services: Coverage with quality and equity” and talked about ways of getting everyone on board, and engaging private health care providers in child survival. June 22, 2012: Partners for a New Beginning (PNB) hosted the Washington launch of the Heartfile Leaders Network on June 11, 2012. The Network is being established to support the work of Heartfile Health Financing and the Sania Nishtar Health Fund. Event details can be viewed here. Partners for a New Beginning is a network operating in ten countries around the world where local projects and priorities are identified by local chapters. The Secretariat strategically matches these projects with US and international partners. 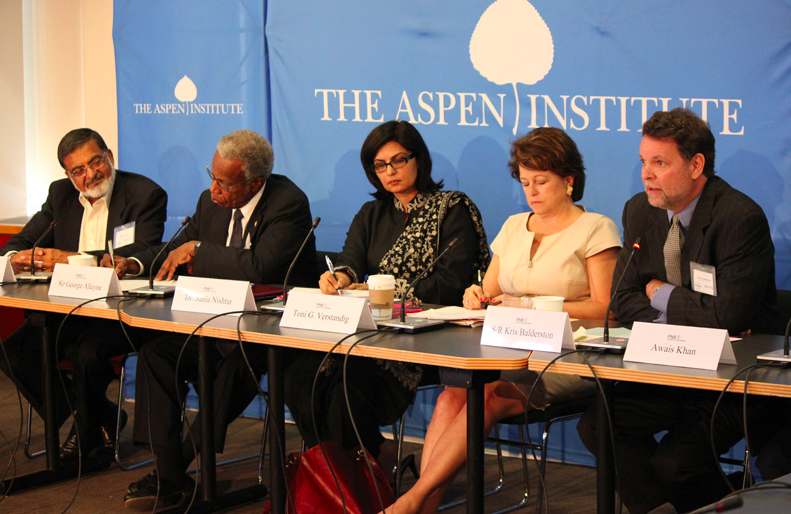 The Aspen Institute in Washington serves as the Secretariat for Partners for a New Beginning. Our President, Dr. Sania Nishtar is a member of the PNB Pakistan Chapter. June 14, 2012: The 2nd Meeting of the Advisory Group of the World Health Organization’s Global Strategy for Health Systems Research was held in Boston at the Harvard Inn on June 11-12. The meeting was hosted by the Alliance for Health Policy and Systems Research. Our President, Dr. Sania Nishtar attended the meeting as a member of the Advisory Committee. June 12, 2012: View a recently released video, which features the work of our president, Dr. Sania Nishtar. The video was shot during the Rockefeller Foundation’s 2011 innovation forum. Click here to view. Bounties of Health launched People told benefits of herbs, fruit and vegetables. June 09, 2012, Pakistan Observer. 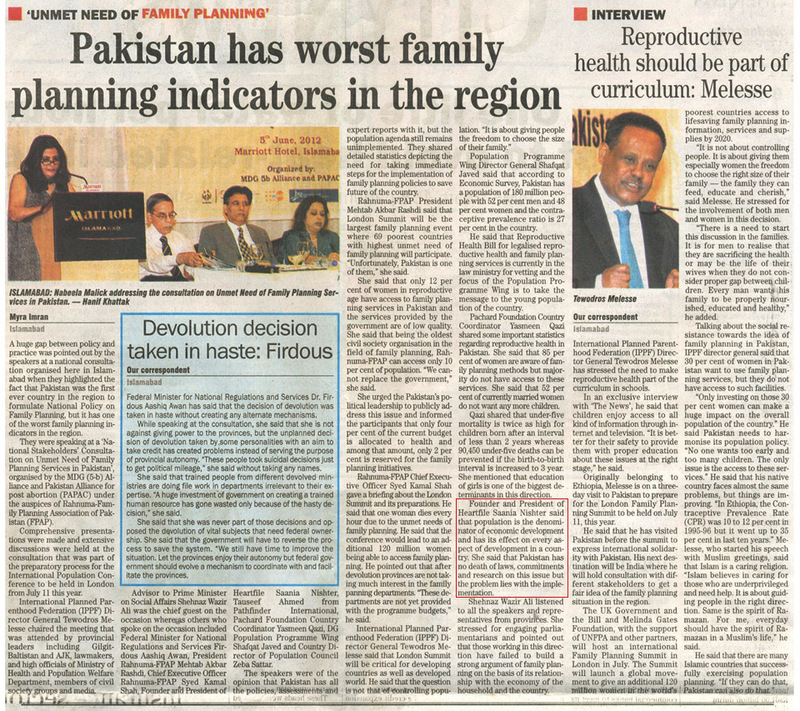 Unmet Need of family planning – Pakistan has worst family planning indicators in the region by Myra Imran, published in The News International, Wednesday, June 6, 2012.